The Summer Internship Program (SIP) forms an important component of education at Faculty of Management Science, SRMSCET, Bareilly. It is an attempt to bridge the gap in the student’s perception between theory in books and practice in the corporate world. Under this, students undertake in between 4 to 6 week internship at any organization/company of repute during the intervening period between close of Semester II and commencement of Semester III as per the guideline given by Dr. APJ Abdul Kalam Technical University, Lucknow. The internship, which would be a simulation of real work environment, requires the students to undergo the rigor of professional environment both in form and substance. It exposes them to technical skills, managerial skills, team player etc. 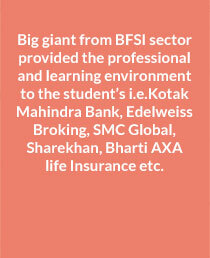 and helps them to acquire social skills by drawing them into contact with real professionals. Internship Program is a vehicle for introducing students to real-life situation, which cannot be simulated in the classroom. 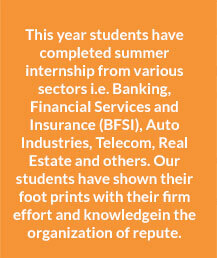 Therefore, internship assignments have been made part of curriculum. Students are encouraged to take up time bound multidisciplinary and goal-oriented assignment involving team work. Solutions to various problems confronted in the internship might be open-ended, involving an element of analytical thinking, processing and decision-making in the face of insufficient data parameters and uncertain situations. Students are advised to read the contents of the handbook of company and guidelines of summer internship of institute carefully prior to commencement of internship. 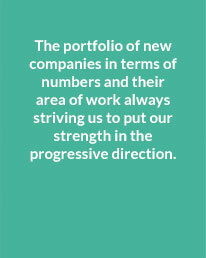 Every student will be assigned a Faculty Guide at the beginning of the Internship Program. The role of the Faculty Guide is to enable the student to undertake a meaningful Report, provide the necessary academic guidance, and to facilitate evaluation, with the aid of the company executives. The Faculty Guide would be involved at all stages of the Internship Program, beginning from ‘definition of the work content’ to Internship Program completion. Every student works under the counsel of a Company Guide, who supervises and evaluates the performance of the student at every stage of the Internship Program and gives feedback to the Faculty Guide/ Placement Coordinator. It is the responsibility of the students to utilize the knowledge and experience of the Company Guide to complete the Internship Program. It is therefore necessary that the students interact with the Faculty Guide and Company Guide regularly to update them about the progress and seek guidance on doing Internship Program. The responsibility of contacting and interacting with the Faculty Guide vests with the students only. During these interactions, the student would be informed about his/her performance, progress in the Program, his/her strengths and weaknesses, as observed through various evaluation components and also ways for improvement. However, the student also has the responsibility to seek clarification regularly from the respective Faculty Guide on these aspects. 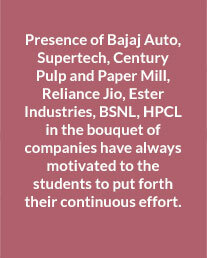 The students during Internship Program are placed in the role of ambassadors of FMS, SRMSCET, Bareilly. The Institute would always expect students to maintain professional and social imprints of high standards in the organization. I hope that we can do wonders in coming years.